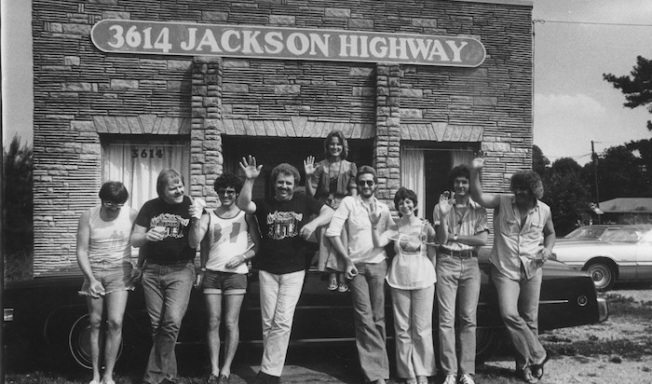 The Swampers at Muscle Shoals Sound Studio in Muscle Shoals, Alabama. "Muscle Shoals" is a must-see, new documentary directed by Greg Camalier, detailing the unlikely, utterly compelling location of Muscle Shoals, Alabama as a key ingredient in some of music's biggest hits sung by the likes of superstars including Bob Dylan, Aretha Franklin, Etta James, Alicia Keys, Wilson Pickett, The Rolling Stones, Jimmy Cliff, Bob Seger, Paul Simon, The Staple Singers, Lynyrd Skynyrd, Percy Sledge and countless others. The tiny town of Muscle Shoals is depicted as a magical, spiritual, music-infused brew of soul and folklore, lending a bewitching je ne sais quois to the musical stylings of so many rock and roll greats who travelled to the area to record and immerse in the juju. At the heart of the story and the scene is Rick Hall, founder of FAME Studios, the recording place, where so much incredible music was created. Overcoming crushing poverty and staggering tragedies, Hall brought black and white together in Alabama's cauldron of racial hostility to create music for the generations. He is responsible for creating the "Muscle Shoals sound" and The Swampers, the house band at FAME that eventually left to start their own successful studio. The Swampers emerge as a charismatic, wildly talented group of passionate musicians proud of their home town and the music they created. Raw and candid interviews, interwoven with old footage, inspiring music, live performances, and the magic of the milieu itself capture and convey this tale. Interviewees include legendary musicians Gregg Allman, Bono, Clarence Carter, Jimmy Cliff, Aretha Franklin, Mick Jagger, Alicia Keys, Ed King, Keith Richards, and Steve Winwood among many others. Percy Sledge will make you want to reach into the movie screen and thank him for the music he made—his anecdotes and magnetism will stay with you long after you leave the theater, as will this entire triumph of a film. "MUSCLE SHOALS" opens September 27, 2013 at the IFC Center in NY and nationwide on VOD, and October 11th in L.A.
For more information on "the incredible true story of a small town with a big sound" visit the website.